Starting a Project with 90 Seconds is quick, easy and simple. In order to start creating video you will need to be signed up and attached to a brand. If you have not done this yet, we recommend you do this now - Sign Up as a Brand. Forget scouring websites for info, talking with tons of agencies, or waiting anxiously for an initial quote. With 90 Seconds, anyone on your brand team can quickly submit a brief and have a response within minutes. You choose your audience, style, tone, video length, or other parameters. We deliver a drag-and-drop briefing structure, guided interface, and a complimentary producer available to offer assistance. No cost, no obligation, no stress. 1. 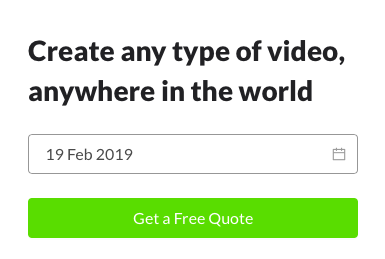 If you're on 90 Seconds Page then click on either 'Get a Free Quote' or 'Create Video.' from the top panel. 2. If you're already signed in on your brand page then click on 'Projects' on top panel and choose 'Create Video' or click on 'Purchase another Video Project' under 'Video Projects In Purchase' section on your brand page. This also applies to any additional videos projects you want to purchase at anytime. The quickest way to get your project started and into production. Perfect if you know exactly what you want and your requirements are met by our pre-scoped video packages. Browse the pre-scoped video packages in our rich inventory. Pick the package which fits your brief.